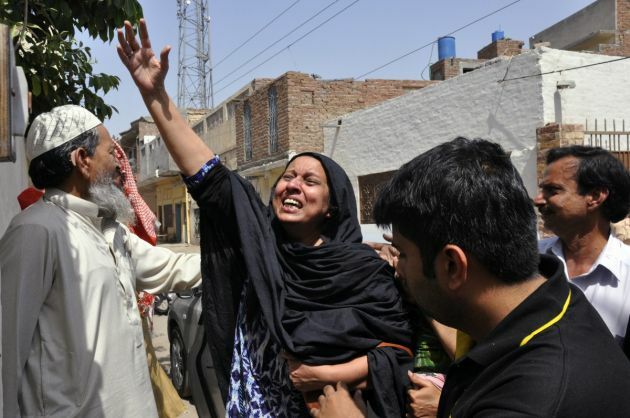 (Photo: REUTERS / Stringer)A woman reacts to the killing of Rashid Rehman, a lawyer who was shot by unidentified gunmen a day earlier, outside his residence in Multan May 8, 2014. Gunmen posing as clients shot dead the prominent human rights lawyer defending a professor accused of blasphemy, officials said Thursday, underscoring the danger facing those trying to put an end to religious intolerance in majority-Muslim Pakistan. Wednesday's killing of Rashid Rehman in the southern city Multan was the first time a lawyer has been killed for taking on a blasphemy case, police said. Gunmen have killed a Pakistan professor accused of blasphemy who faced peers' threats for holding moderate views on Islam, authorities have said, as controversy swirls over the law that can result in the death penalty. Two men riding a motorcycle shot at close Muhammad Shakil Auj, the dean of the faculty of Islamic Studies at the university in Karachi, killing him instantly, Reuters news agency reported. Auj was in his car and heading for the Iranian Cultural Center for an event when the shooting occurred. "A bullet pierced through his head, proving fatal," senior police officer Pir Mohammad Shah said. Another bullet struck Auj's junior colleague, named only as Amna, in the arm, wounding her, AFP reported. "We are investigating the killing. It would be premature to state the motive at the moment," the officer continued as he declined to make any statement as to what led to the killing of the professor. While police were assembling evidence for a lead into the killing, a colleague said Auj had received threats because of his teaching, which some described as too liberal. The colleague, who declined to be identified for security reasons, said the professor received flak for publishing a paper that essentially argued it was all right for Muslim women to marry a non-Muslim man. In the past years, Auj was accused of blasphemy, a crime that carries death as punishment. But activists said the crime was being used by some people to settle grudges or extort money. Blasphemy is not defined by law, so anyone can sue a person on the basis of their religious feelings getting offended. People who are accused of the crime may be jailed indefinitely. The blasphemy case against Auj was ongoing at the time of the attack, but police have yet to connect the killing with the proceeding. Another university professor, who taught English, was locked up for the same offense after he posted on social media a statement deemed blasphemous. His lawyer was killed by gunmen in May.